He is as unassuming as the age-old trees surrounding the imposing limestone karsts of Krabi just a hike away from the Maritime Park and Spa hotel, yet he has a Midas touch. General manager Panitan Supawong is bent on a mission to saving the earth with everything he touches, and he’s been devising all kinds of hi tech gadgets to rev things up - or rather down - just to save on watts. Plugs are yanked off electrical sockets in the guest rooms. Incandescent lights are replaced by compact ones. Air-conditioning in rooms is set at no lower than 25 degree Celsius. The cooling mechanism of the existing air-conditioning system is to make way for a newer, less fuel guzzling equipment that recycles heat waste to hot shower systems. The list keeps growing, mostly through staff suggestions, all to save precious energy. Thank goodness at least there’s ice in the fridge for my evening cocktails, which I had to make by turning down the chill knob, rather guiltily, if I may add. This project to cut energy wastage began less than a year ago as part of the hotel’s new direction and commitment to the Green Leaf Program, an environmental policy for hotel’s sustainability, endorsed by major names such as Thai Tourism Authority and UNESCO. The program is part of the Green Leaf Foundation that involves a stringent auditing process covering areas such as policy and standard of environment practice, waste management, efficient use of water and energy, purchasing (e.g. seasonal products), storage and management of fuel, gas and toxic waste, ecological impact and community involvement. Since Panitan came on board as Maritime’s GM a year and half ago, the hotel has gained a notch higher in Green Leaf rating, but my host is not gloating. "I haven’t done much," he whispers. Perhaps we should be the judge of that. Apart from recycling materials and practising water conservation, the hotel donates its used cooking oil for bio diesel conversion, which fuels agro tractors. It also organises a clean up day during low season where staff go around the park picking up rubbish. As there’s no fence dividing hotel property from the national park grounds, a wider area gets a good sweep. Not having a fence also means that the living creatures of the park are free to meander around the hotel property. Maritime is committed to preserving the natural habitats surrounding it, so you may just stumble upon a monitor lizard or local otter sticking its head out of the pond. Snakes are native to the reserve but phosphorus powder on the ground keep them well at bay. Having achieved much, the general manager shared what it meant to him personally. "I’m happy to do something for the hotel and its owner. That’s because the hotel isn’t as profitable as the popular beachside ones. Hence we need to keep our costs down, through energy saving and more." said Panitan. 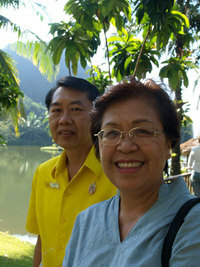 "I’m also pleased when staff change in their views on environment conservation at the work place. I hope they continue the practice back at home." he added. Later in the evening, I soaked in my lime and marigold scented bath outdoors while bathing in the sights of the imposing karsts and the rich vegetation surrounding it. 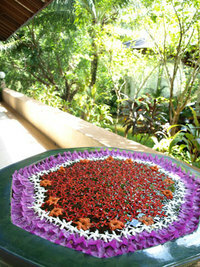 Adora Spa at the hotel grounds is delightfully Thai with its range of treatment oils, herbs, scrubs and massage. Connecting with nature, I felt my aches melt and my mind drift. It is hard to adjust to nature when it’s most idyllic. It is also hard to imagine that this oasis of green is in Krabi town and just 20 minutes drive to the famed Ao Nang and Railey beaches. And slurping spicy seafood tom yam kung (sweet sour soup) served in a baby coconut shell at Maritime Park and Spa’s only restaurant, my senses jolt and my nose runs. Yet, I dig in for more. 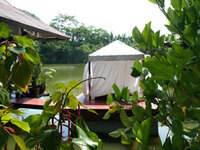 Here’s a green hotel in southern Thailand that simply energises. Getting there: Fly direct to Krabi International Airport, then transfer by car to hotel in just 10 minutes. You can also take a connecting flight to Krabi from Bangkok or Phuket. Travelling by land from Phuket is possible in 2 hours.